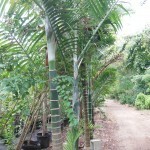 Palms for Autumn Planting - Richard Lyons Nursery, Inc. Believe it or not, southern Florida is beginning to cool down, at least statistically. Our region has endured a very warm summer; we seem to have had temperatures 3-5 degrees above historical averages for months. However, the day-night mean temperature for mid-October should be 80°, down from 85° during the July-August peak. 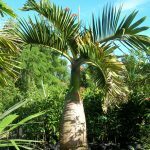 While we are entering the time of year when a lot of palm species don’t take kindly to transplanting, this is an excellent season in which to plant container-grown palms. That’s because their root systems are established and won’t have to go through recovery from being cut. Container-grown palms installed during the autumn are able to expand their root systems over the winter months so that the plants can put on vigorous crown growth when hot weather returns. All that’s necessary is steady watering so that rootballs stay hydrated. 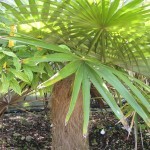 Coccothrinax argentata is one of Florida’s native species. The strong silvery coloration found on the undersides of its leathery leaves gives rise to its common name, the Silver Palm. It grows best in a sunny, well-drained exposure and slowly reaches about 20 ft. Fruits mature from white to purple. It is tolerant of poor soils. 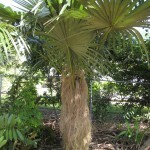 Coccothrinax crinita, the popular Old Man Palm, is endemic to Cuba. Its trunk is covered in beardlike woolly fibers, and the undersides of its palmate leaves are silvery. In our region, this sun-loving species can reach 25-30 ft. slowly. It requires moderate water and good drainage, but is drought-tolerant once established. Dypsis cabadae is a water-loving species that was almost unknown here 35 years ago. 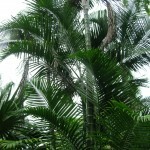 Its dark green stems with white rings marking where leaves once were gives this palm a bamboo-like appearance. It reaches 30-40 ft. at maturity and can be grown in light shade to sun. It is native to islands off the coast of Madagascar. Dypsis leptocheilos, commonly called the Teddy Bear Palm because of the rust-colored fuzz (tomentum) on its crownshaft, is a critically-endangered native of Madagascar. This single-stemmed species matures to about 30 ft. and bears prominent leaf scars on its whitish trunk. It prefers sunny exposures and lots of water. It bears very long pinnate leaves, but almost no petiole. Hyophorbe lagenicaulis is the Bottle Palm, a critically-endangered native, endemic to Round Island in the Indian Ocean, near Mauritius, where perhaps only 15 are said to remain. 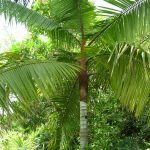 However, due to its popularity in tropical and subtropical climates, this palm is plentiful in cultivation worldwide and is perfectly at home in limestone soils, such as those found in South Florida. It features a swollen gray trunk and small green crownshaft consisting of 4-8 ascending pinnate leaves. It reaches about 10-15 ft. at maturity.